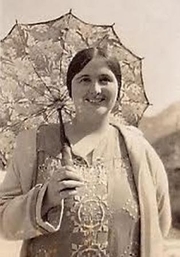 Patricia Wentworth was the pen name of Dora Amy Elles. She was born in India, then under the British Raj, where her father was stationed as a British army officer. As was the custom, she and her brothers were sent to private school in England. She returned to India and married George F. Dillon in 1906. He had three children from a previous marriage and they had one child together. After his death, she and the children moved to England. In 1920 she remarried to George Oliver Turnbull and settled in Surrey. She had begun writing while in India and won the Melrose Prize in 1910 for her first published novel, A Marriage Under the Terror, set during the French Revolution. As Patricia Wentworth, she wrote a series of 32 crime novels beginning in 1928 with The Grey Mask – the last was published in 1961, the year of her death – featuring Miss Maud Silver, a brilliant retired governess with a passion for knitting and Tennyson, who becomes a private detective and works closely with Scotland Yard. It's noteworthy that Miss Silver predates Miss Marple, the creation of Wentworth's contemporary Agatha Christie. Patricia Wentworth also wrote a book of verse for children and a couple of other poetry volumes, plus more than 30 other books outside the Miss Silver series, for a total of 70 novels in her career. Patricia Wentworth is currently considered a "single author." If one or more works are by a distinct, homonymous authors, go ahead and split the author. Patricia Wentworth is composed of 14 names. You can examine and separate out names.